The Most Amazing Autumn Flowering Plant - And It's Not A Mum! Before I go any further about the most amazing autumn flowering plant ever, I want to make it perfectly clear this isn’t an article to knock on mums. Mums, or Chrysanthemums as they are officially named, are indeed wonderful choices for fall baskets and planters. They are available in a wide range of beautiful colors. They bloom big, bright, and for weeks on end. And, when correctly timed for blooming, flower during the peak of autumn. 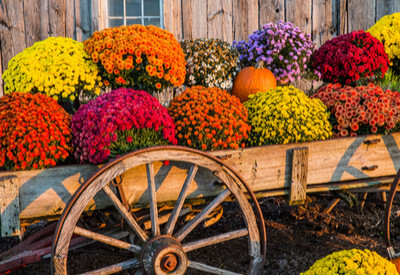 We have always loved using mums every fall to add instant color all around the farm. But many visitors to the farm are often surprised when we tell them they are not our favorite autumn flowering plant. In fact, for us, they are a distant second. As pretty as they are, there are a few drawbacks to Chrysanthemums. For one, they seem to be about the only choice available for fall flowering plants at nurseries and garden centers. They can also be quite expensive to purchase, especially for medium to large size plants. In addition, when you consider you only get to enjoy them for a few weeks of the fall season, and that they can be difficult to keep from year to year, mums begin to lose a bit of their allure. Beyond Mums – The Most Amazing Autumn Flowering Plant Ever! Yes indeed there is another great option. And even better, this amazing flowering plant adds brilliant fall color to pots, planters, and hanging baskets all spring and summer long too. But in the fall, it goes to another level. Ornamental peppers peak in the fall, and are a great choice for fall color! And unlike a mum, which can be difficult to grow and manage for fall blooming, this autumn flowering plant can be re-grown easily each year from seed. So what is this most incredible autumn flowering plant we love so much? The ornamental pepper plant. Ornamental peppers are simply amazing. They are available in so many varieties, and in all kinds of shapes, colors and sizes. And although they are spectacular from late spring to late summer, when autumn arrives, they become stunning. Incredibly stunning! Ornamental Peppers – Spring, Summer and Fall Beauty! We first started growing ornamental peppers at the farm 8 years ago. I happened to be strolling through a local garden center and noticed a few 3″ pots of Sangria ornamental peppers. As soon as I spotted them, I remembered them instantly from a few years prior. I had been out west on a trip and found the most unusual and yet beautiful planting to the entrance of a hotel I had ever seen. And it was made from Sangria ornamental peppers. They had planted them everywhere! Hundreds of thousands of gorgeous tiny colorful peppers in beds, hanging baskets, planters and pots as far as the eye could see. It was overwhelmingly beautiful and stunning. In fact, so much so, that I remember tracking down a hotel employee to find out exactly what they were. And so on that fateful day, I purchased the few pots that were available, and our love affair with ornamental peppers began. But as fall approaches, the magic really happens. 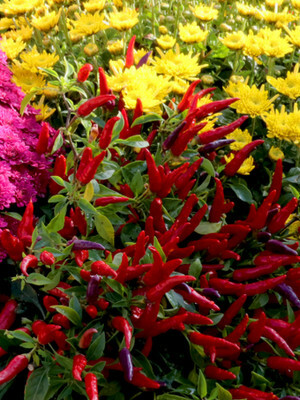 While petunias, begonias and other traditional summer annuals fade away, ornamental pepper plants stay healthy and vibrant. And they begin to turn all of their peppers to deep, fiery shades of orange and red. Color that blends beautifully with the turning shades of an autumn landscape! They really are the most amazing fall flowering plant! Although the Sangria peppers remain one of our favorites. we continue to find more ornamental pepper varieties to plant every year. Easy To Grow From Seed, And Economical Too! And apparently, the secret about using fall ornamental peppers for fall color is out. Just yesterday, as we walked out of a local store, there were huge large pots of ornamental peppers for sale as fall plants! Who know, maybe in a few more years they will be the new mum! Happy Autumn! Jim and Mary. ← How To Easily Install Metal Panels For Walls, Ceilings, Porches And More! 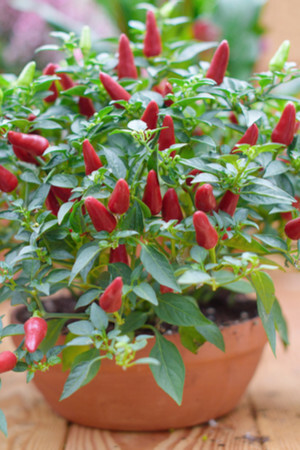 Hi Marcia Most ornamental pepper plants are edible, but many do not have any flavor at all. We LOVE our Chinese 5 color peppers. It makes the best hot pepper powder – great taste and heat that doesn’t linger. We use it in the majority of our recipes. You are more than welcome – we love the beauty of them all! Hi Linda. Saving seeds is quite easy. Just pull off a few peppers before winter and let them dry out naturally. Once they are dried, split open the pepper and remove the seeds. We then let the seeds dry out even more – usually on a paper towel until they are completely dry. We then store them until we are ready to plant in the Spring. Hope that helps! I am assuming they are NOT edible??!! Can you explain how you harvest and save the seeds to plant the following Spring? Also, please share any planting tips you have. Do these need to have full Sun or do they do well in part shade? Plant maintenance needed? Just beautiful. I’ve long admired ornamental peppers, ever since seeing them planted many years ago at Six Flags in Atlanta. Now you’ve inspired me to plan for some plantings next year. Thanks!